Introduction: A small, Rx-powered shared preferences library for Kotlin. This library provides reactive shared preferences interaction with very little code. It is designed specifically to be used with Kotlin. Inspiration has been taken from other libraries, but it was written from the ground up on its own. The core of the library is the RxkPrefs interface. You can retrieve an instance of this interface with the rxkPrefs method, which takes 3 parameters. One of these parameters is optional (the shared preferences mode). // First parameter is your Context, like an Activity, the second is a key. // The optional third parameter is a mode, it defaults to MODE_PRIVATE above. With a RxkPrefs instance, you can retrieve preferences. By that, I do not mean the raw value of the preference, but an instance of the Pref interface which provides more functionality. Once you have a reference to a preference, there are a few things you can do with them. // This is always a String. // Or the primitive default, such as an empty string, 0, or false. // The current value of the preference, or the default value if none. // Changes the value of the preference. // True if a value has been set, otherwise false. // Deletes any existing value for the preference. You can receive changes to a preference in real-time with its Observable. Further usage of this is more of an RxJava issue and less specific to this library. You should have a basic understanding of what you can do with RxJava and what its use cases are. Pref itself acts as an Rx Consumer. 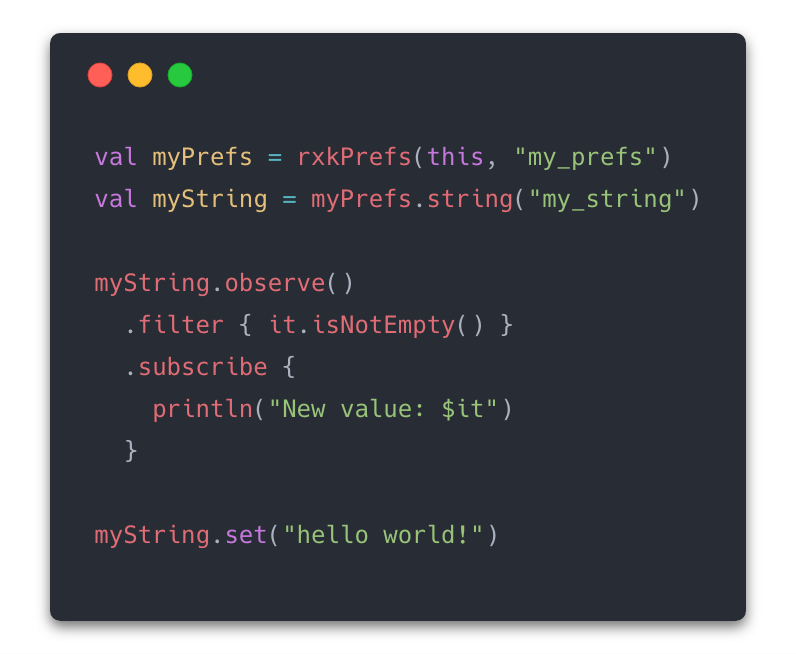 You can use this to save preference values from the emissions of an Observable. Whenever the checkbox is checked or unchecked, the underlying boolean shared preference is set to true or false automatically.